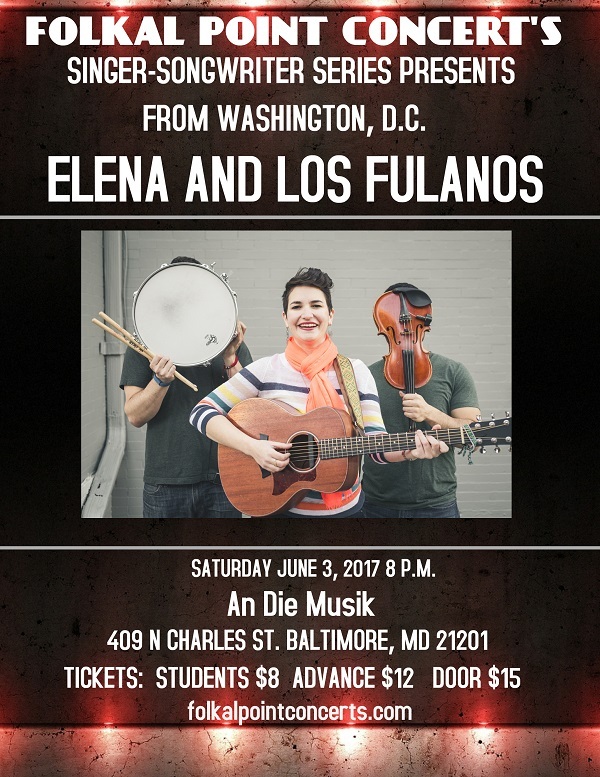 charmcityartsmaven: FOKAL POINT CONCERT SERIES PRESENTS “ELENA & LOS FULANOS” JUNE 3 @ AN DIE MUSIK LIVE! FOKAL POINT CONCERT SERIES PRESENTS “ELENA & LOS FULANOS” JUNE 3 @ AN DIE MUSIK LIVE! Formed in 2011, Elena & Los Fulanos came together on the streets of DC’s rapidly changing neighborhoods of Columbia Heights and Mt. Pleasant, where working immigrant communities co-exist with young political and nonprofit leaders. That is where Elena was introduced to the District’s mariachi, son, and punk music crowds and met her future band members. Together they are part of the city’s growing indie and international music scene. In 2014 they released their debut Wammie-nominated album, Miel Venenosa, with CD release shows in both Washington, DC and Managua, Nicaragua. Elena Lacayo (vocals, guitar, banjo) grew up in Managua, Nicaragua. She moved to the US to attend college in Indiana in 2002 and moved to Washington, DC to pursue a career in advocacy upon graduation. After building a career centered on the passage of just national and state immigration laws, she transitioned to focus on music in 2012 and has been loving life ever since. Danny Cervantes (vocals, violin, ukulele, other small, stringed instrument) grew up in Los Angeles, California where he was part of mariachi groups from a very young age. After attending Stanford University, he moved to DC to work in politics. He is also in the Mexican folk band Los Gallos Negros where he plays even more small, stringed instruments. Andrew Northcutt (percussion, guitar) spent his youth up in Mexico City, Mexico. He derives cathartic pleasure from making pleasant sounds while beating on things. When his soul is at peace, he prefers to pluck the strings of nylon guitars in a style that can only be described as influenced by rock, jazz, flamenco & classical. Sometimes he smashes all this insanity together into loops, which you can hear some of on Bandcamp.